Please refer to our stock # TBD00225 when inquiring. 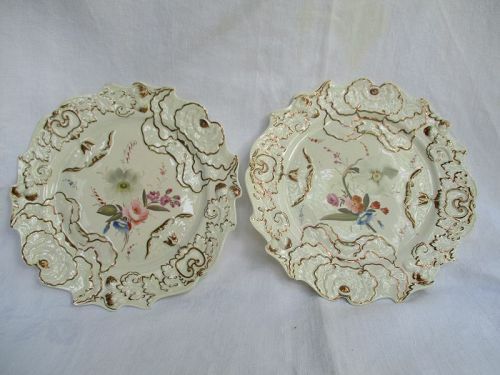 A pair of CJ Mason porcelain plates circa 1825 A pair of distinctively molded bone china porcelain plates from the Mason factory circa 1825. Each is hand painted with a bouquet of flowers and the molded pattern enhanced with copper tinged gilding. They have no maker’s mark, but this molded porcelain is associated with the factory. Pattern mark 963 on the back of both, though the “9” is hardly there on one of the plates. 8 ½ inches diameter. Condition: Very little wear to either, but both have small chips to the points on the edge of the plate. One has three little chips to the points and the other two. The extra gilding makes these plates very showy.